Looking to schedule an appointment? Call one of our Angels today! 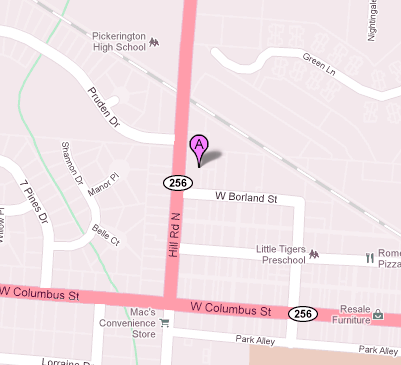 Essie's Angels is located in the heart of Olde Pickerington. We hope you enjoy your experience at Essie's Angels. We strive to make it a heavenly place! All of our staff members are independent contractors who set their own appointments. They each offer a variety of services. All prices represent a general range. Please check with your stylist for her specific prices. We currently have booth space available for 2 hair stylists and 1 nail tech. Sandy has lived in the Pickerington area since 1994. She invites you to come and experience Essie's Angels. You will find it a fun, friendly, and relaxing place to visit. I have been behind the chair since 1999. I specialize in cutting, coloring and highlighting. My hours are Tuesday-Friday, 10am-5pm. I also work the last Saturday of every month. Please call to ask about Monday hours. I am a licensed cosmetologist and a trained barber. I have provided hair and makeup services for bridal show runway models. My specialty is blonde highlighting/weaves. My goal as a stylist is to give you a haircut that is attractive and easy to manage. I enjoy what I do and look forward to meeting you at Essie's Angels. Call me today. Ginny Withrow knows great hair design isn't just about the image on the outside but about making sure the angel inside is satisfied. She has years of experience behind the chair and she knows and values the importance of education and keeping up with current trends. She will listen and address you needs with the care of an angel and create a style that works best for you. She specializes in creative and corrective color, foil highlighting and precision hair cutting. Copyright 2019 Essie's Angels. All Rights Reserved.